Alright everyone, in this post, I left you with ripped up carpet and painted walls. Over the last few days we have been laying out, cutting, sometimes re-cutting, adjusting, and setting tiles for my parent’s bathroom. 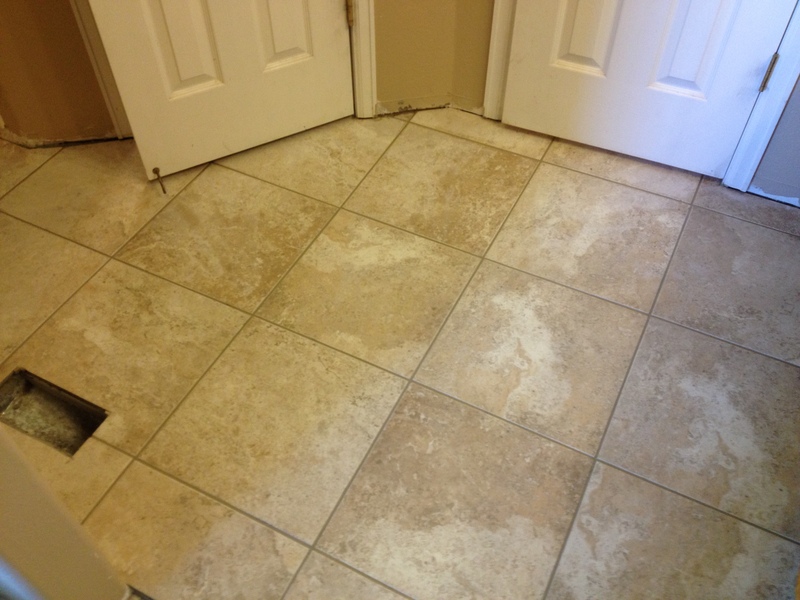 It is the first tiling project we have done in the house, and it was pretty easy minus a few odd cuts around doors. BUT OMG is it messier than I expected. 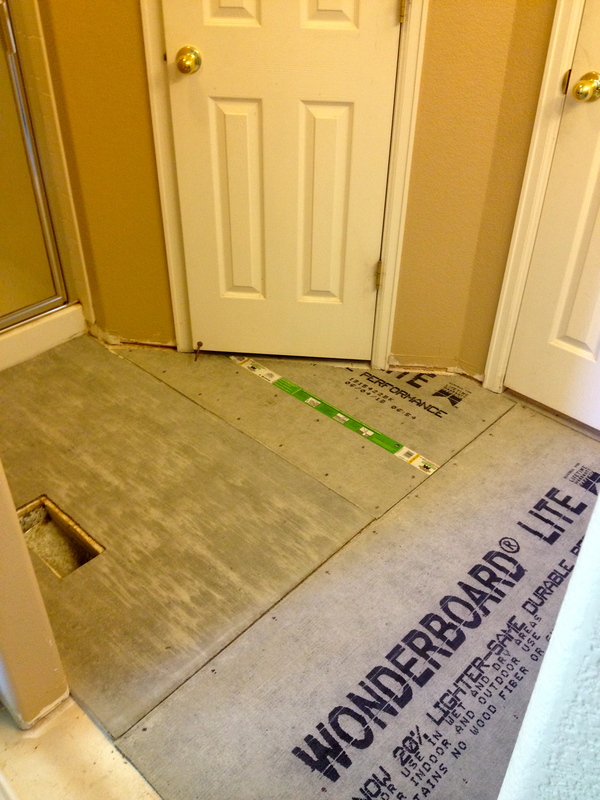 Just as a reminder, here is what the bathroom looked like before with gross carpet. After we ripped out the carpet (to read about how we did that, click here) and linoleum that was in the toilet section, we were here. 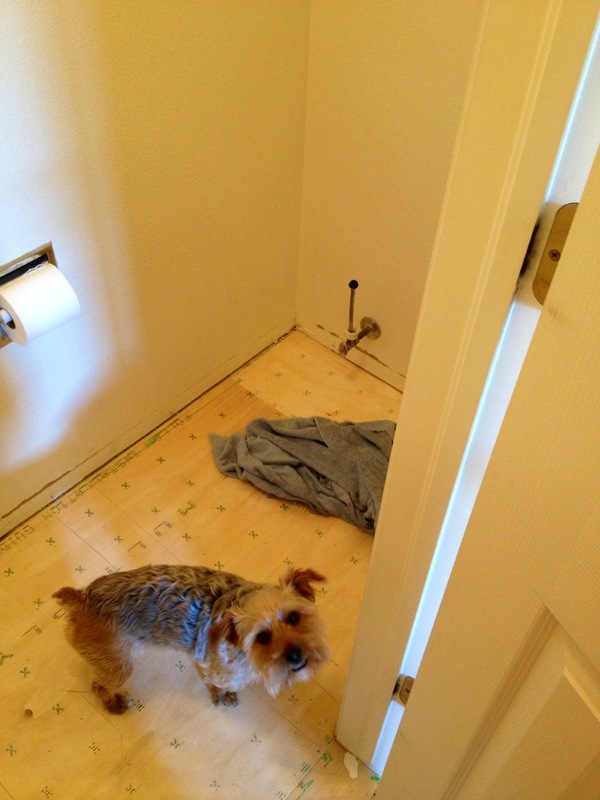 There is Sadie again :) The linoleum had this other layer of wood under it. This needed to be ripped up as well. This was loaded with staples, make sure you remove anything on your subfloor. 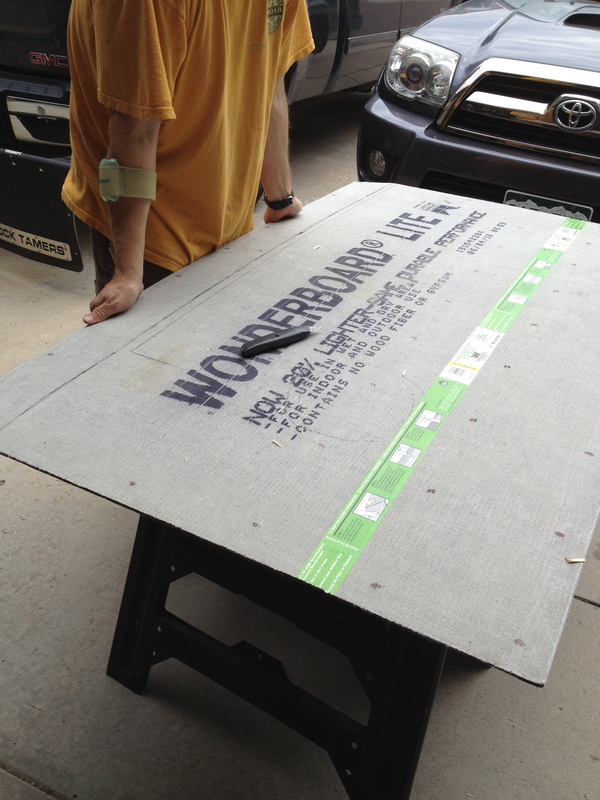 Prepping your surface is very important when laying any type of flooring! 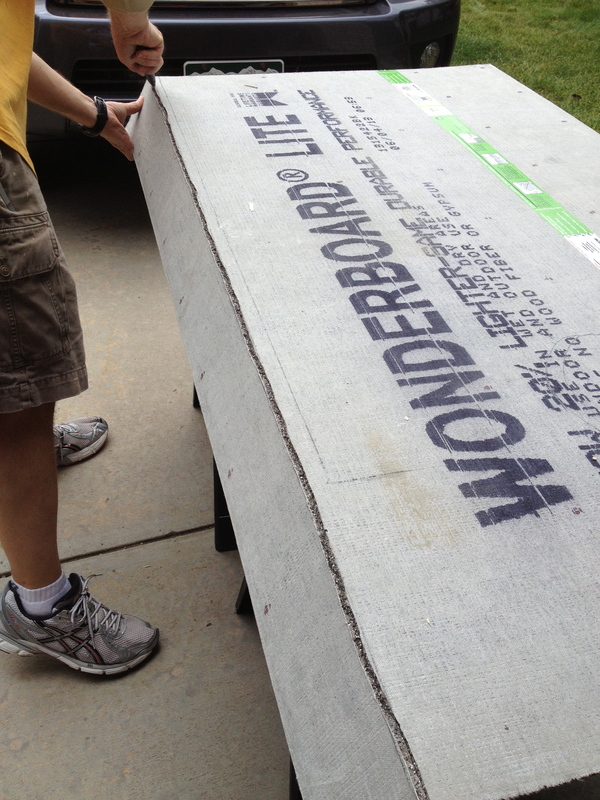 At this point, we needed to start putting the backer board on the floor. 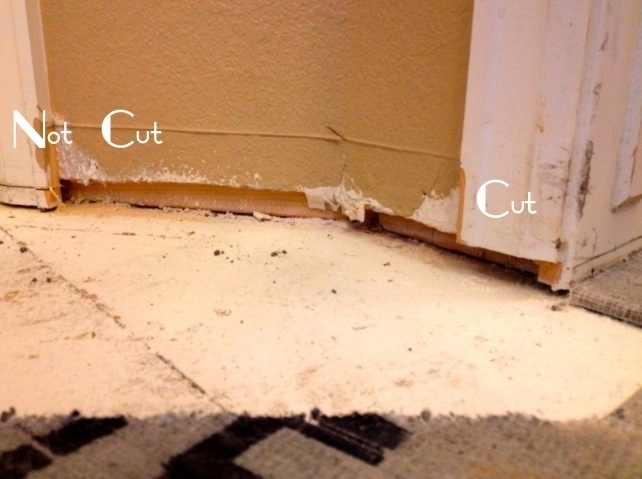 Floors get 1/4″ and walls get 1/2″. 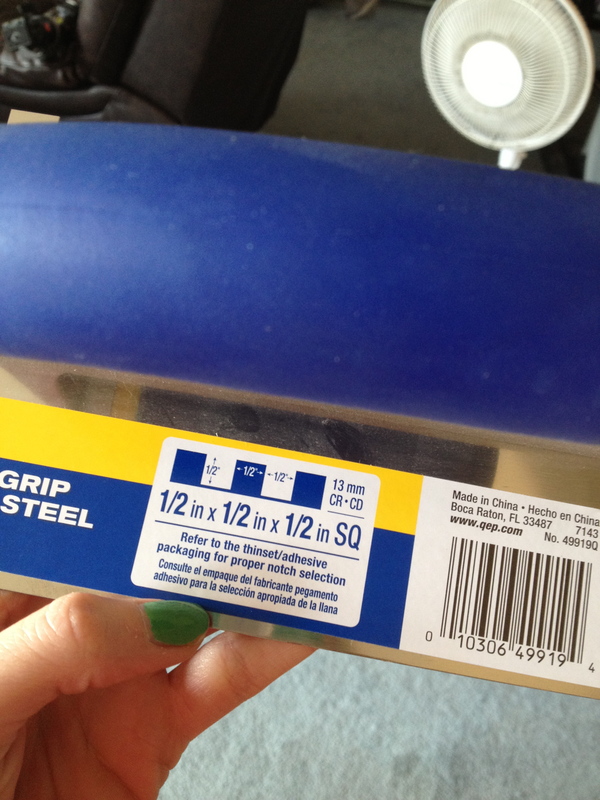 This stuff is easy to cut so do not be scared by it! Just use a good Utility knife to score it and snap it off. Measure twice to ensure a correct cut. Here is the main space covered. 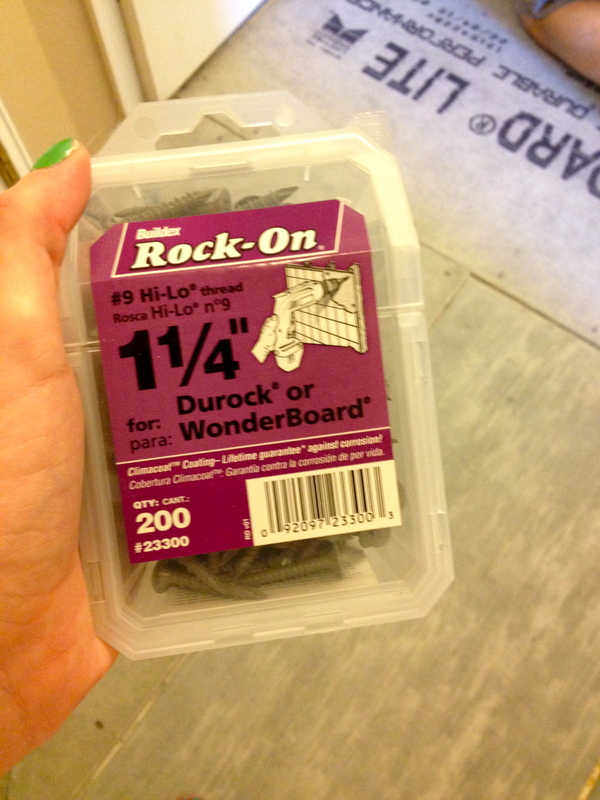 There are special screws you use for backer board, so make sure you grab the right kind when shopping! Here is what we used.. The boards come with a guide on where to put the screws. There are A LOT. In my opinion, every other one will suffice. 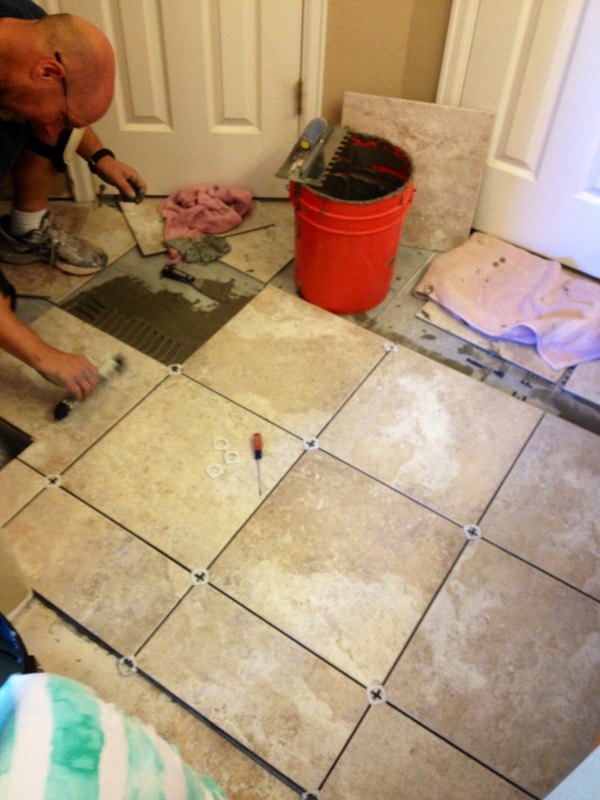 We decided to lay out all our tiles and make cuts before using any thinset. This just ensures everything will fit, and is easier than running back and forth making cuts and allowing your thinset to dry out before you can use it. 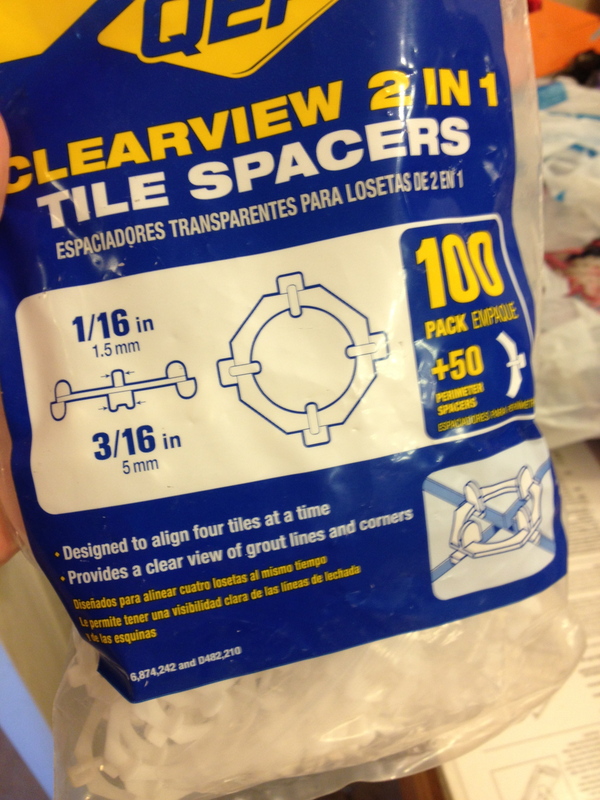 This is important because if your thinset is too dry when you apply your tiles, they will probably pop off later on. At my Home Depot, there are a few options for spacers. Most were rubbery and would bend and change shape if pushed too hard between tiles. 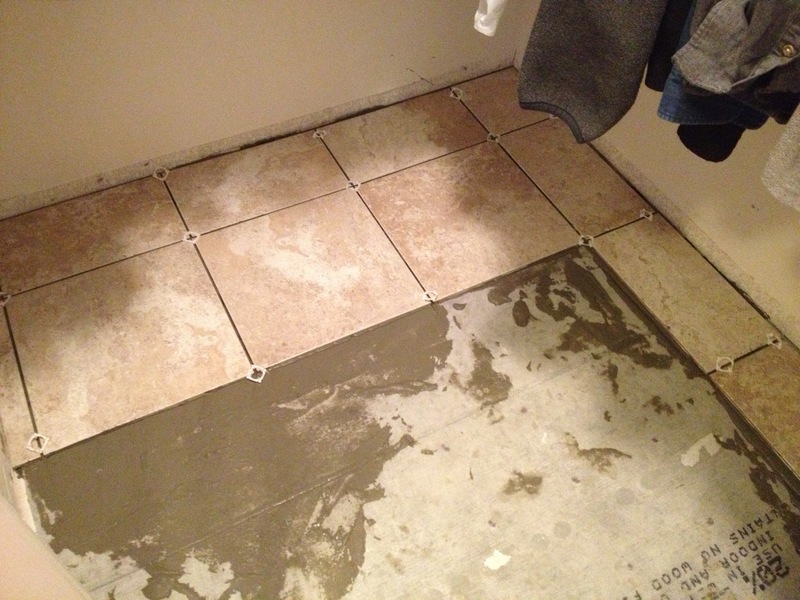 We decided the hard plastic ones were the way to go just to make sure all the grout lines were even. We used the 3/16″ sides. I loved these. They were so easy to use and we will be able to save them for future projects! 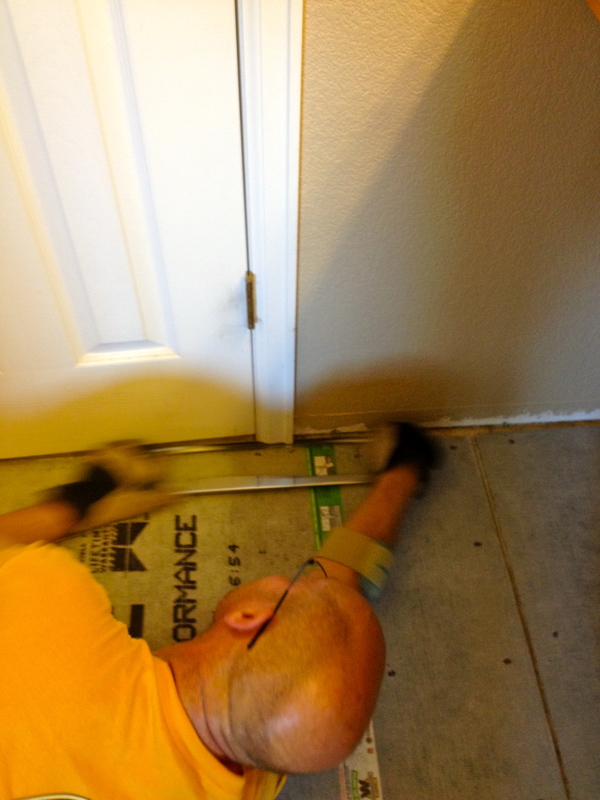 While we were laying out the tiles, we cut the mouldings around the door so that the tile and thinset will be able to fit underneath. My dad used a hacksaw. This is important to make sure everything fits properly. 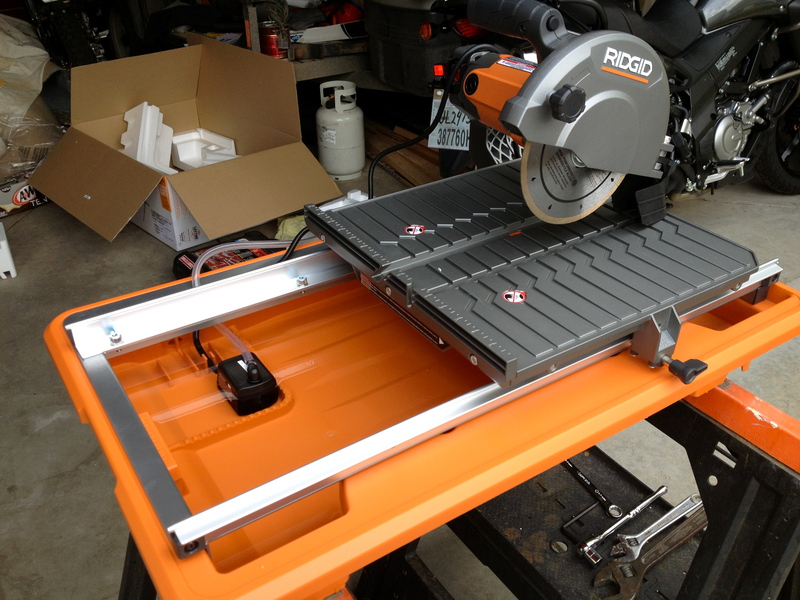 Time to use the Tile Saw! I was able to try it and I can say it was simple to use and I was impressed with it. When everything was cut, we worked in sections. I would recommend working in the back of the room and making your way to do the door, but since we were only doing a few rows the first day, we started at the front where we had a chalk line to make sure everything was straight. Then in the following days we worked off that. 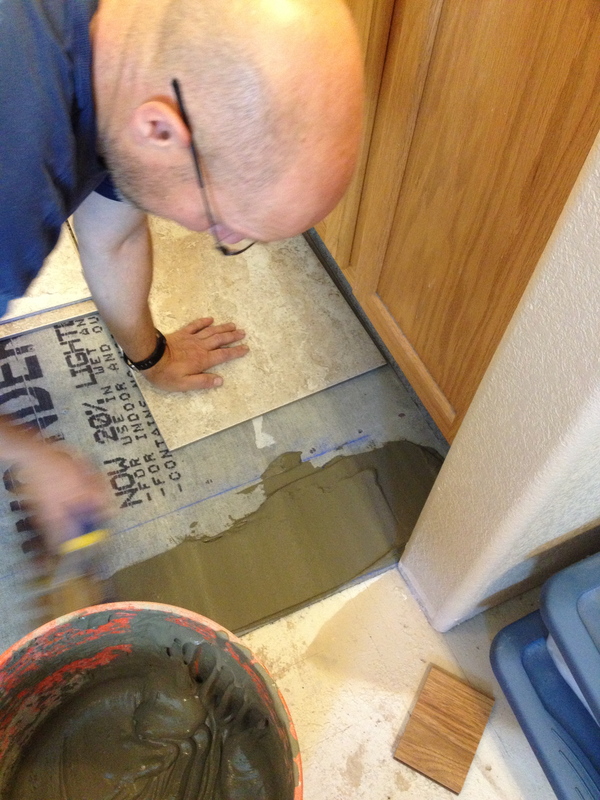 The larger the tile, the larger the trowel. 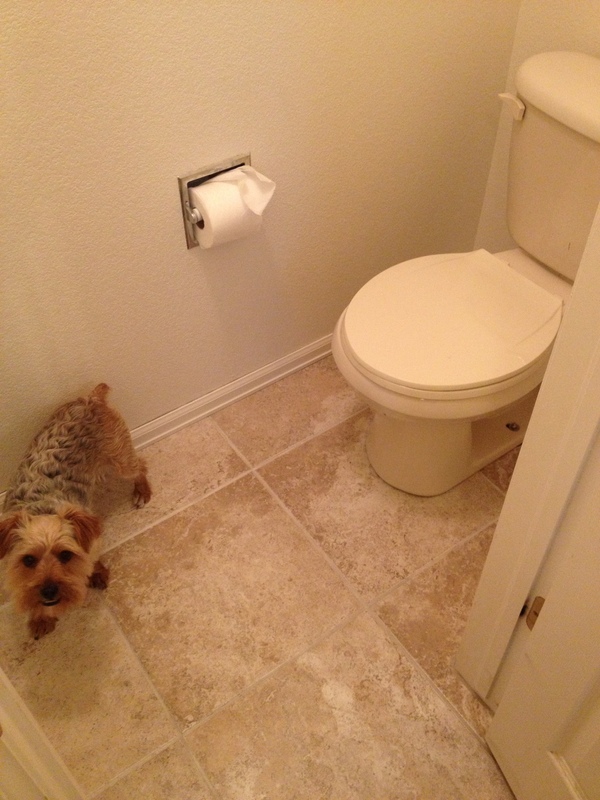 Ask someone in the flooring department if you have questions regarding which would work best for your project. Here was the messy part! Clean up as you go! Also, make sure you have a level handy to check things out periodically. 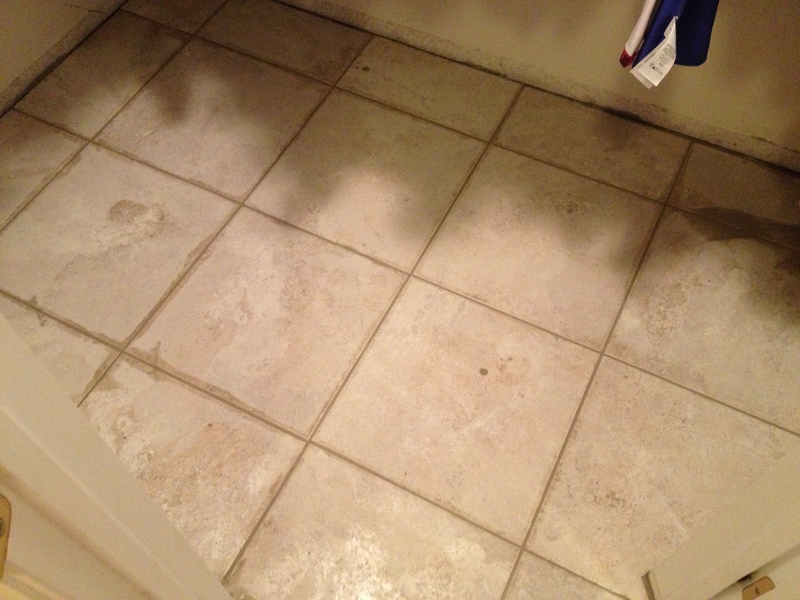 Once all your tile is set, let thinset dry for 24 hours before walking on it! 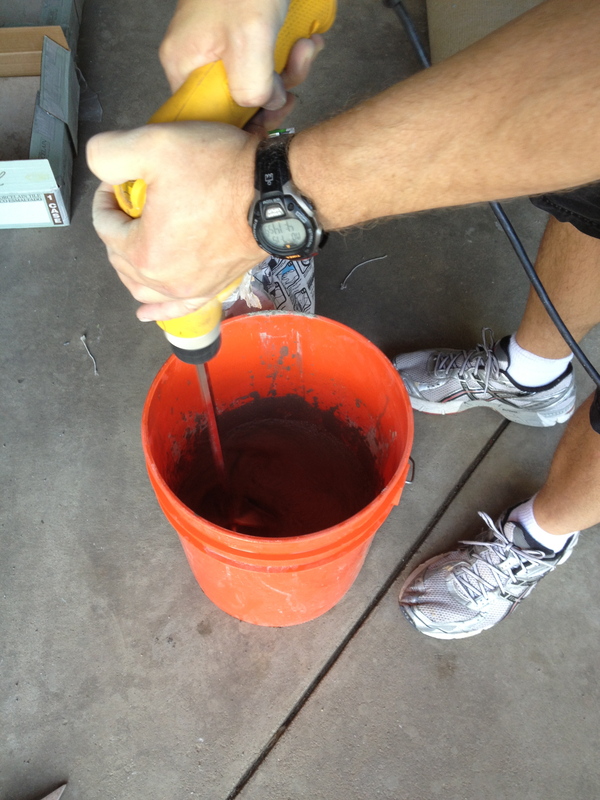 Mix according to instructions, and use a grout float to apply. 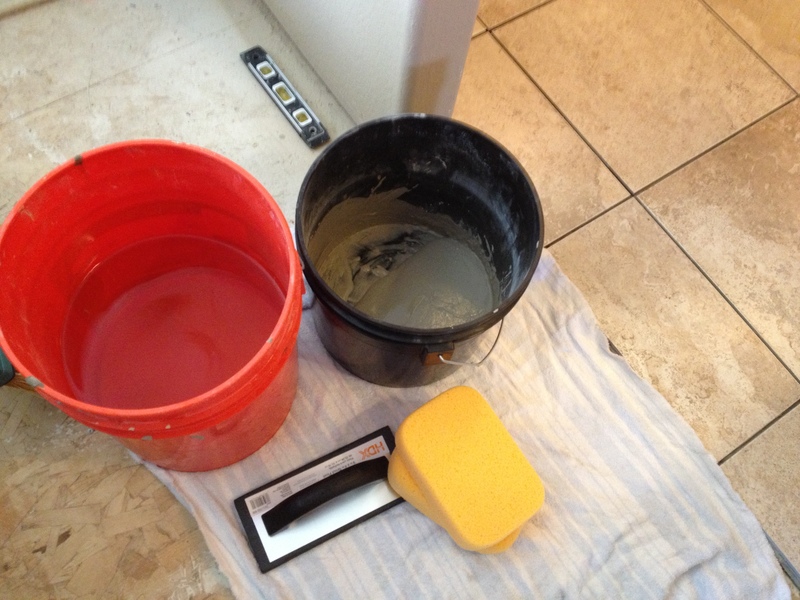 For this process you will also want several sponges, a bucket of water (change this out often), and your grout. 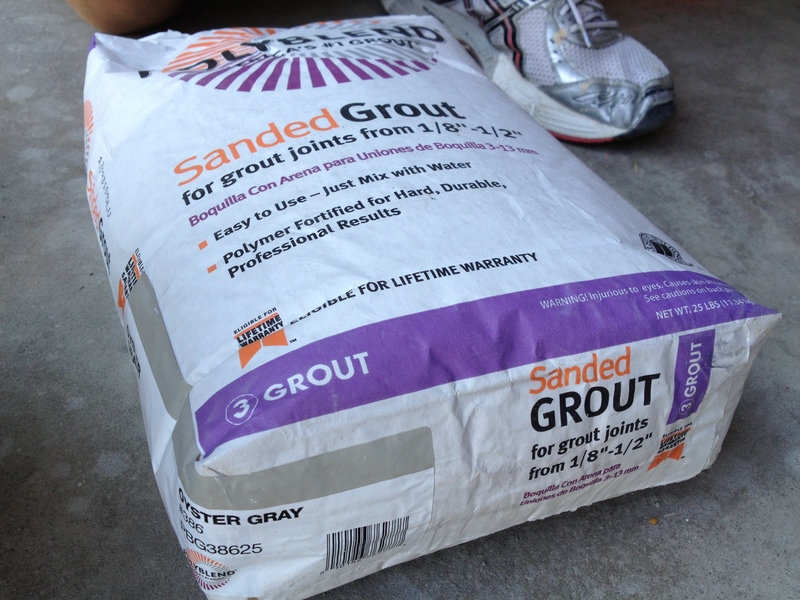 Spread grout over all joint lines. 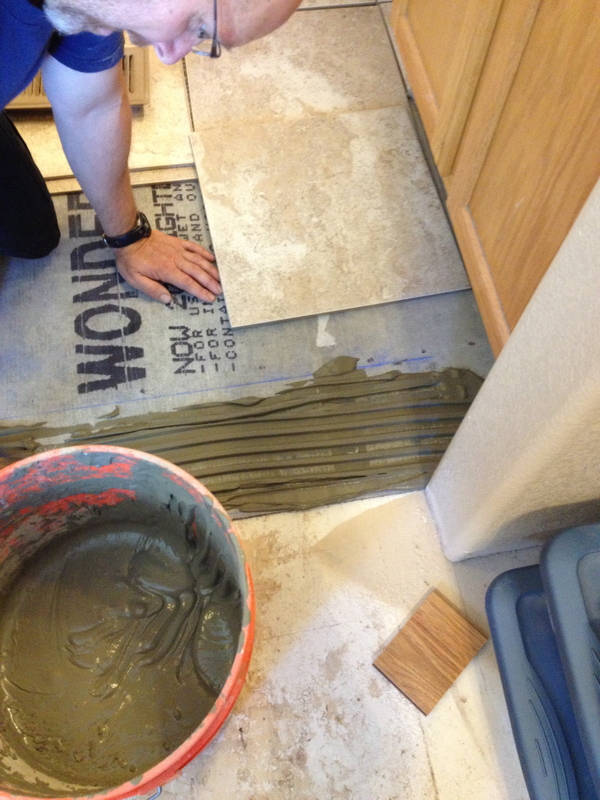 Hold the grout float at a 45 degree angle. 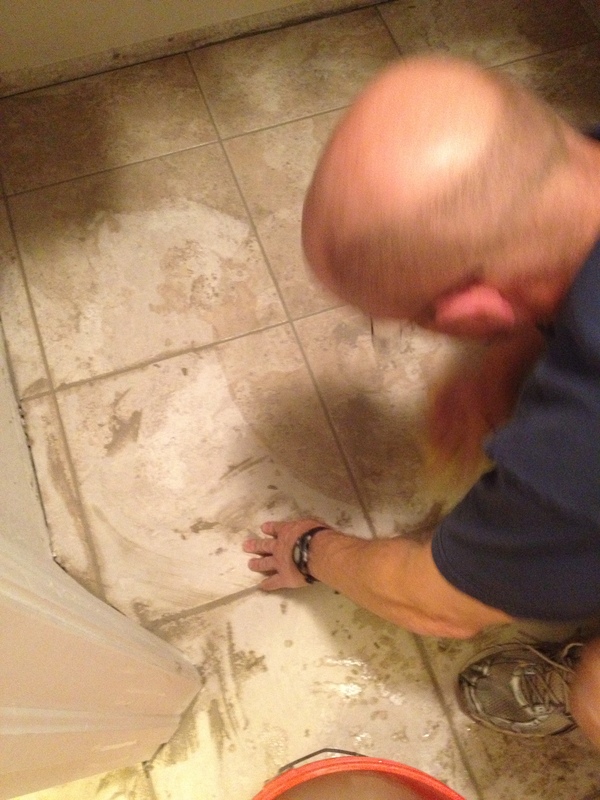 Once applied, wait 20-30 minutes and then use a wet sponge to wipe off excess grout from the tiles. 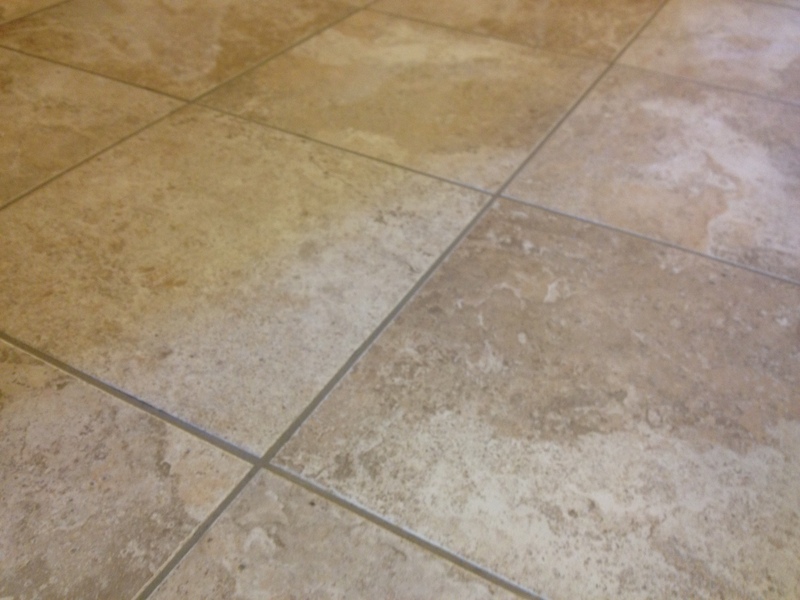 They will probably look hazy the first time around so you will need to clean off the tiles a few times to remove this! I recommend a sponge that has a rougher side for the last cleaning. The last two pictures really show the haze I was talking about! After that is all removed and cleaned up, you have a finished product!! 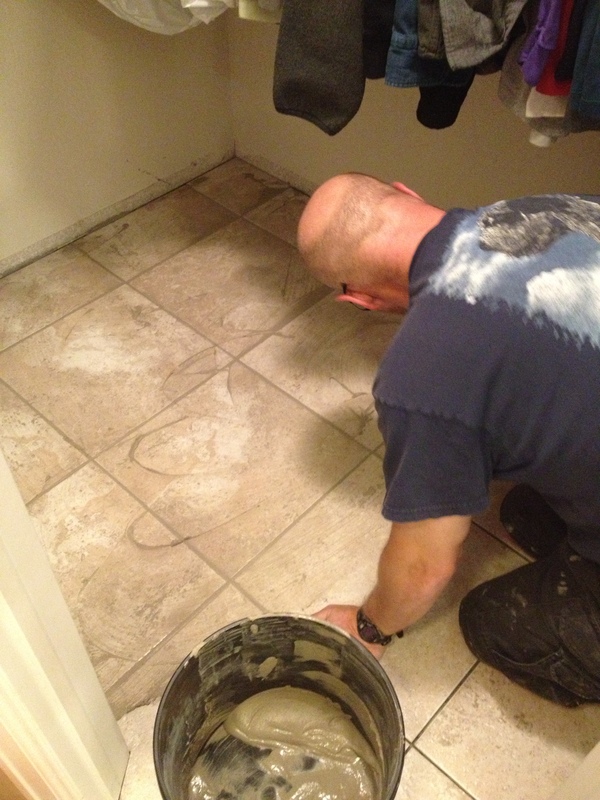 The last step is sealing the grout! Check your local store as there are many options for sealers in Home Depot. We just sprayed it on after the grout has had 48 hours to cure and then waited the recommended five minutes to wipe it up! Easy! Now, come back tomorrow to see the Pergo laminate! The whole room looks awesome! Can’t wait to show you guys! What have you tiled?! 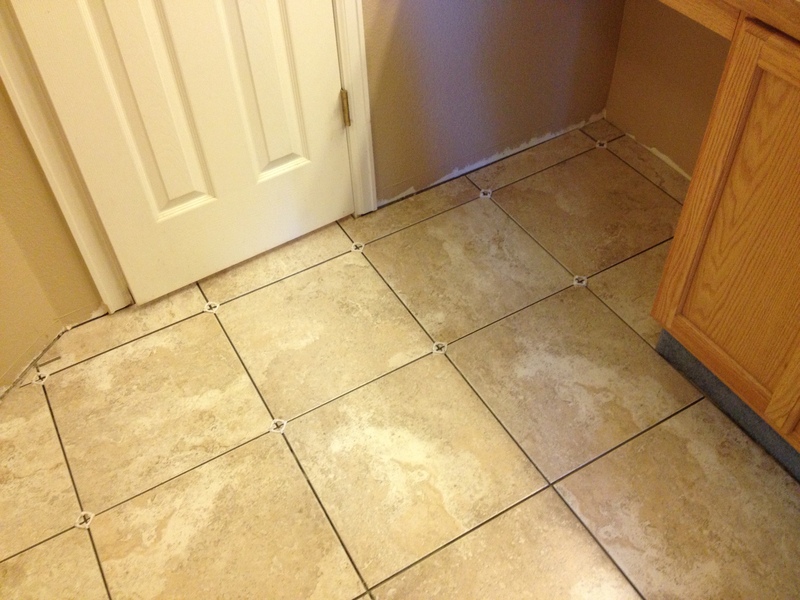 Did you have a good experience or are you never touching tile ever again? 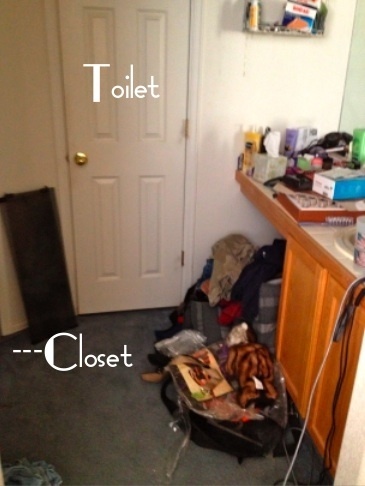 I am hoping to tackle my much smaller bathroom all on my own!